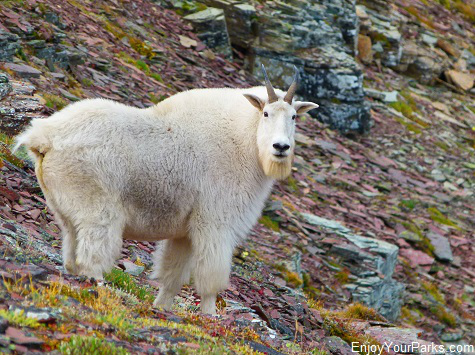 in British Columbia, Canada, and provides hikers with remarkable and very unique views of the remote Northern Wilderness of Glacier National Park, Montana to the south. 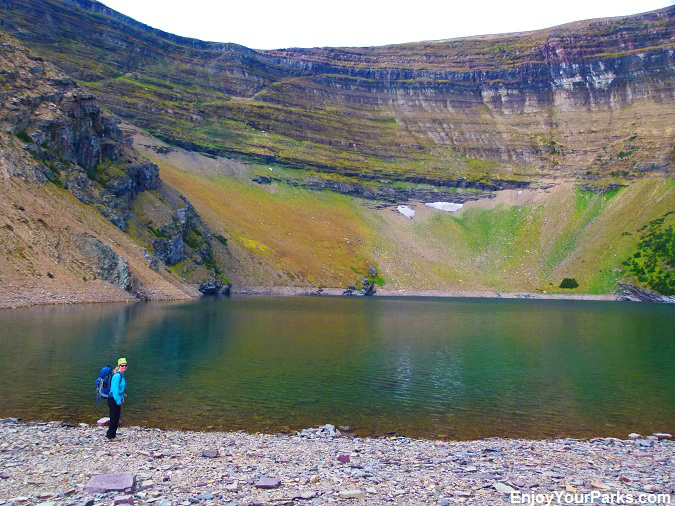 The hike around the Akamina Ridge Loop near Waterton Lakes National Park also takes you along two mountain lakes that are both nestled underneath tall rocky walls... one is Forum Lake and the other is appropriately named Wall Lake. The day we photo-documented the Akamina Ridge hike was quite dark and drab, so we will take our cameras back up during a clear blue day to do this gorgeous hike justice.... but for now our "drab weather" photos will have to do. The trailhead to Akamina Pass and Akamina Ridge near Waterton Lakes National Park is located along the Akamina Parkway, just about a mile before reaching Cameron Lake. 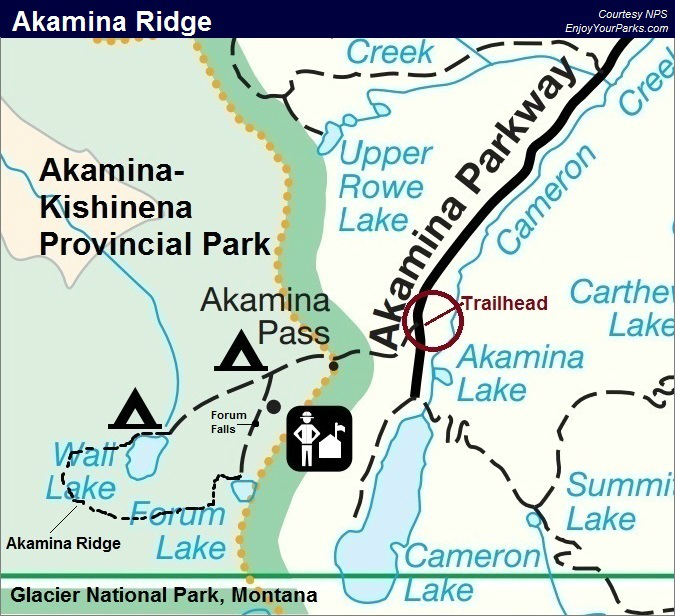 The trailhead is to your right while heading toward Cameron Lake, and the trailhead sign says "Akamina". You can't miss it, and there is a parking area located on the other side of the road. The initial section of the hike around the Akamina Ridge Loop near Waterton Lakes National Park is basically an abandoned dirt road through a pleasant forest that climbs about 350 vertical feet in about a half mile. 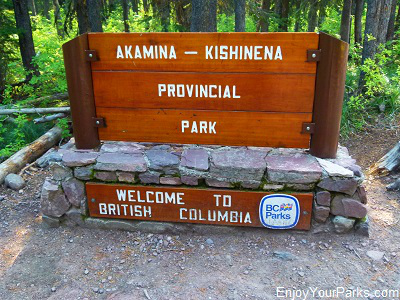 In about 0.6 miles from the trailhead you will encounter the entrance into Akamina-Kishinena Provincial Park in British Columbia, Canada. 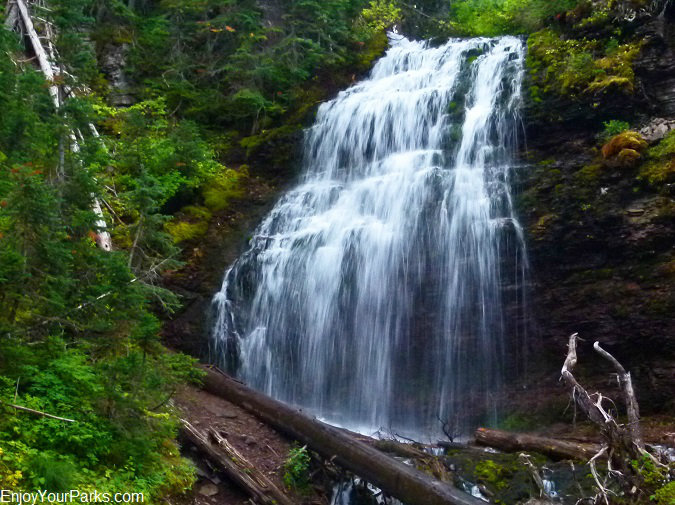 The rest of your hike is located in this beautiful provincial park. 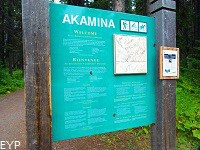 The boundary line is obvious, as there is a large wooden sign welcoming you into the Akamina-Kishinena Provincial Park. 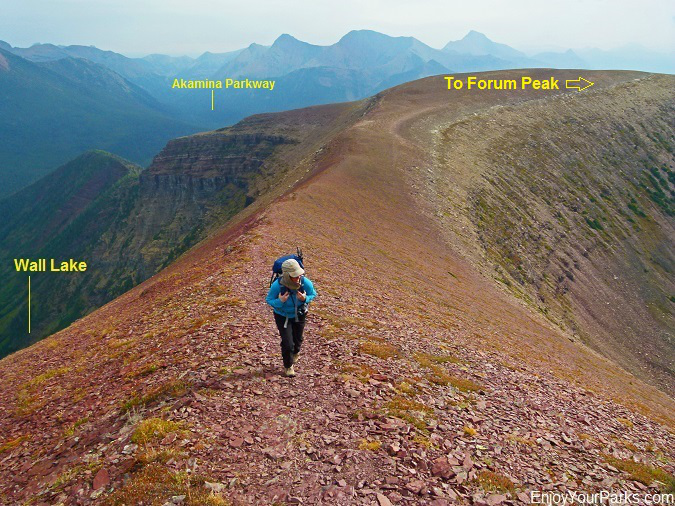 Approximately a half mile beyond the entrance to Akamina-Kishinena Provincial Park along the Akamina Ridge Loop, you will encounter the Forum Lake Junction, which is in the general area of what is known as "Akamina Pass". Near this junction rests the "Akamina Pass Campground", which is a back country campground designed for overnight backpackers. This is the beginning of the actual "loop" section of your hike along Akamina Ridge. The trail to the right takes you counter-clockwise around the loop, where you will first hike by Wall Lake, then up to Akamina Ridge. The trail to the left is the clockwise direction, and it first takes you to Forum Lake before working its way up to Akamina Ridge. We strongly recommend that you take the Forum Lake trail (left) for your Akamina Ridge hike because the views will always be in front of you instead of behind you. Also, if you're hiking in the early morning, the sun won't be in your eyes the entire time. Forum Falls along the Akamina Ridge Trail in the Akamina-Kishinena Provincial Park, British Columbia. From the Forum Lake junction, the Akamina Ridge trail will then work its way through a very nice sub-alpine forest as it follows Forum Creek. In only about 300 yards there is a short spur trail that takes you to Forum Falls, which is definitely worth the extra 150 yards or so. The trail then begins to climb in vertical elevation as it heads for Forum Lake. Forum Lake along the Akamina Ridge Trail in Akamina-Kishinena Provincial Park, British Columbia near Waterton Lakes National Park. 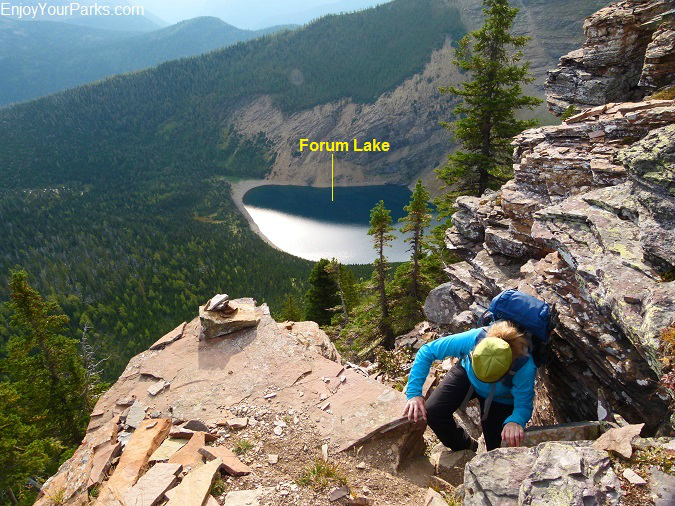 Forum Lake is nestled underneath the steep north slope of Akamina Ridge and Forum Peak. This is the perfect place to fill your water bottles with your water pump and filter before heading up to the ridge. There is no water along Akamina Ridge, so this is your last chance for water. 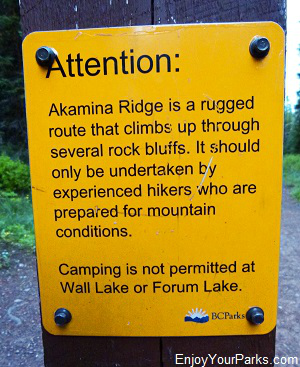 You will find the "Akamina Ridge" trail sign as you head right once you reach the lake. 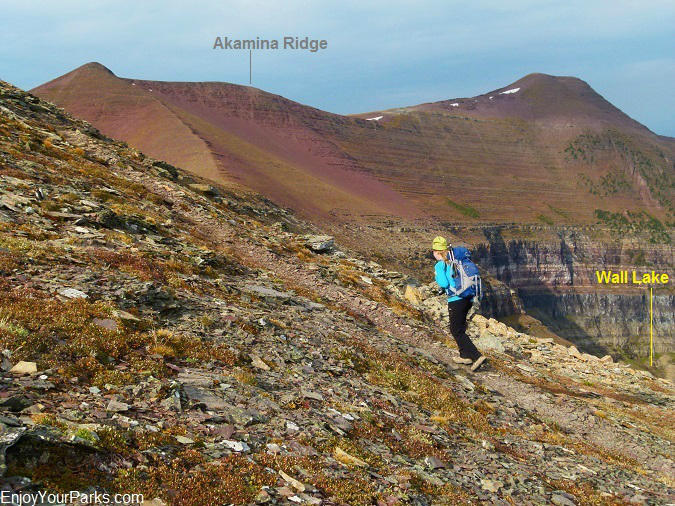 The Akamina Ridge Trail near Waterton Lake National Park will then begin to head west as it gains a fair amount of vertical elevation while working its way toward Akamina Ridge. The actual Akamina Ridge runs east to west, but there is a bluff (ridge) that shoots off Akamina Ridge that runs north and south. This bluff (ridge) is also what separates Forum Lake from Wall Lake. This is the bluff (ridge) the trail will first take you to, and this is where the trail "climbs" the ridge to eventually get you on top of Akamina Ridge. The trail will continue to gain in vertical elevation as you get further from Forum Lake and closer to the north-south running bluff. In about a mile the trail literally starts to head straight up the east side of the bluff through rocky cliffs. This is the most difficult part of the trail because there is a little scrambling involved as you work your way through the rocky cliffs. There are little piles of rocks, called "ducks" to help mark the best route up this rocky slope, and you need to use your hands at times during this section of the trail. As you climb up the west side of this bluff, make sure you look back and enjoy a great view of Forum Lake to the east. Shannon along the Akamina Ridge Trail in Akamina-Kishinena Provincial Park, British Columbia, near Waterton Lakes National Park. Once you reach the top of the bluff (ridge running north and south), you will see Forum Lake to the east, and directly below you to the west is Wall Lake. 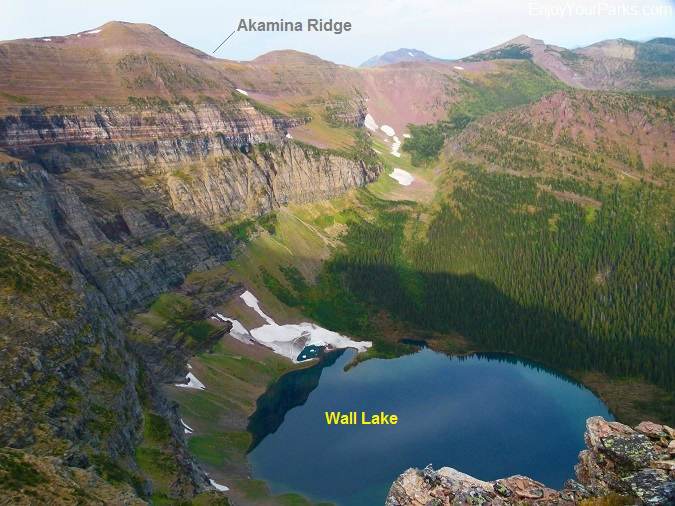 Surrounding Wall Lake is the huge north wall of Akamina Ridge. From this vantage point, you can see the long Akamina Ridge almost in its entirety. This is a view of Wall Lake and Akamina Ridge from the top of the bluff that Shannon just climbed (see previous picture). The trail on top of this bluff takes you to southward to the main Akamina Ridge. Shannon hiking along the bluff heading for Akamina Ridge, Akamina-Kishinena Provincial Park, British Columbia near Waterton Lakes National Park. Once on top of the bluff, the trail then heads up this ridge straight south towards the actual Akamina Ridge that awaits you in all of its glory. After about another half mile, you will reach Akamina Ridge, and you will then immediately begin enjoying amazing views of Glacier National Park to the south and more. 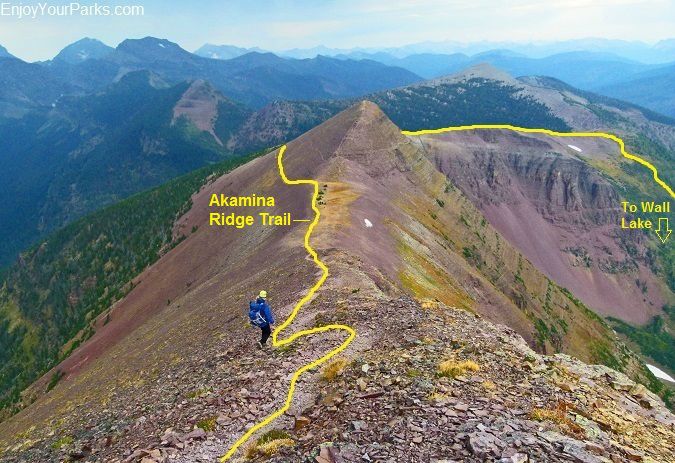 Once you reach the actual Akamina Ridge, you have the option of first heading left (east) along the ridge, which gradually takes you to the summit of Forum Peak. 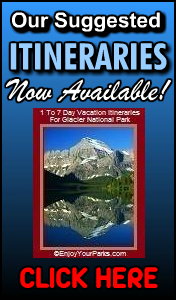 This is a very easy hike that provides great views of Waterton Lakes National Park, Akamina-Kishinena Provincial Park, and Glacier National Park all at the same time. There are three summit cairns, so there is no mistake that you are standing on the summit. This spur trail will only add about 1.5 miles to your day, and is well worth the effort in our opinion. As the trail takes you westward along the amazing Akamina Ridge, the views seem to get more and more incredible, especially to the south as you will gaze into the remote Northern Wilderness of Glacier National Park. 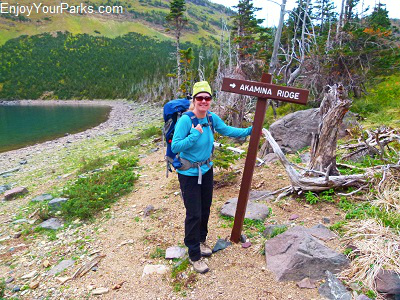 There are three high points, or "bumps" along the Akamina Ridge trail, where if you follow the well-worn trail, you will hike to the left side of two of them if you want to save a little bit of vertical elevation gain. The middle high point is the tallest point along the Akamina Ridge, and the trail will take you to this point. There is a really small cairn on this "bump" that doesn't receive much attention. A view of the Kintla Peak Area of Glacier National Park, Montana from Akamina Ridge. Our favorite part of the hike along the Akamina Ridge Trail is the unique view into the Northern Wilderness of Glacier National Park. 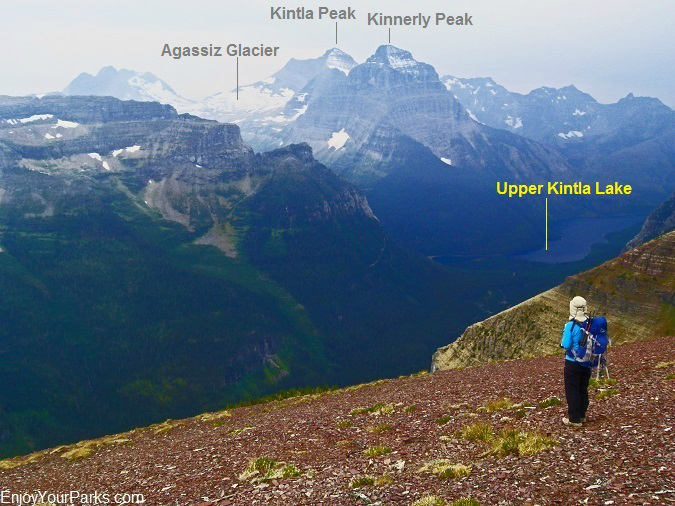 You will see the Boulder Pass Area, as well as the gigantic Kintla Peak and towering Kinnerly Peak, as well as Upper Kintla Lake, and the massive Agassiz Glacier (see photo above). Knife Peak of Glacier Park dominates the view to the west. 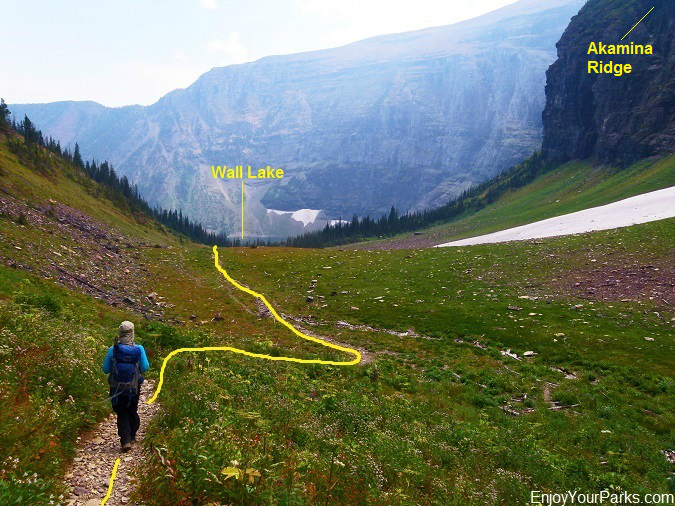 We spend a lot of time in this northern section of Glacier Park, which can only be accessed via the Boulder Pass Trail that originates at Kintla Lake or Goat Haunt in Glacier National Park. This is one of the most scenic areas in North America, and it is fascinating to see this remote area from this unique vantage point. We'll head back up Akamina Ridge during a clear day and photograph this area again... and you'll see what we're talking about. Akamina Ridge Trail in the Akamina-Kishinena Provincial Park. The trail leaves the Akamina Ridge just beyond where Shannon is standing, and drops into the valley that you see in this photo and takes you to the shore of Wall Lake. 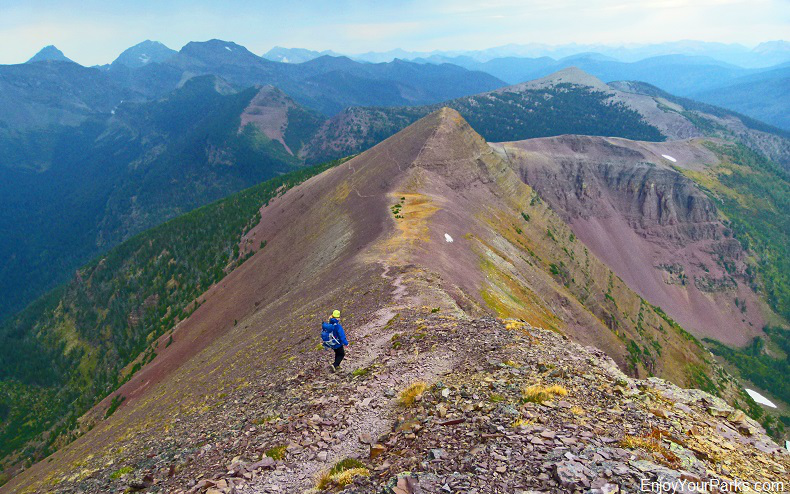 The total distance you will hike on Akamina Ridge near Waterton Lakes National Park is about six miles before the trail heads northward and then begins to take you down off the ridge. Your will leave the ridge about a mile west of Wall Lake. 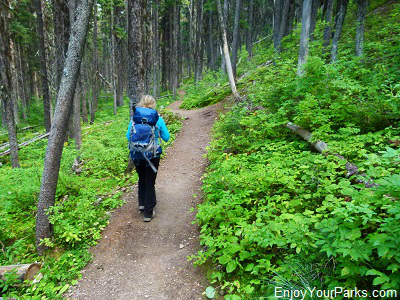 As you drop off Akamina Ridge, you will hike through a wonderful Larch (Tamarack) forest as the trail takes you eventually through a very nice open basin that at times is filled with wildflowers during the summer season. The magnificent north wall of Akamina Ridge towers over you to the south the entire hike down to Wall Lake. 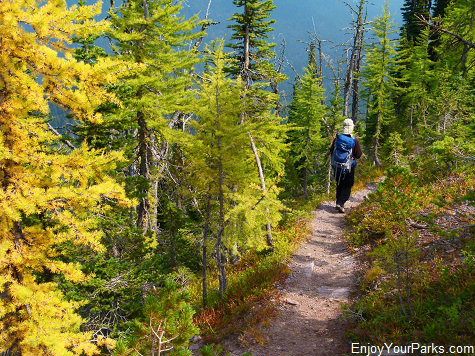 During the fall, the Larch, a.k.a.Tamaracks, turn a bright yellow, which is an added bonus during your hike as you work your way to Wall Lake. Shannon heading to Wall Lake after dropping down off of Akamina Ridge. Wall Lake along the Akamina Ridge Trail in Akamina-Kishinena Provincial Park near Waterton Lakes National Park. 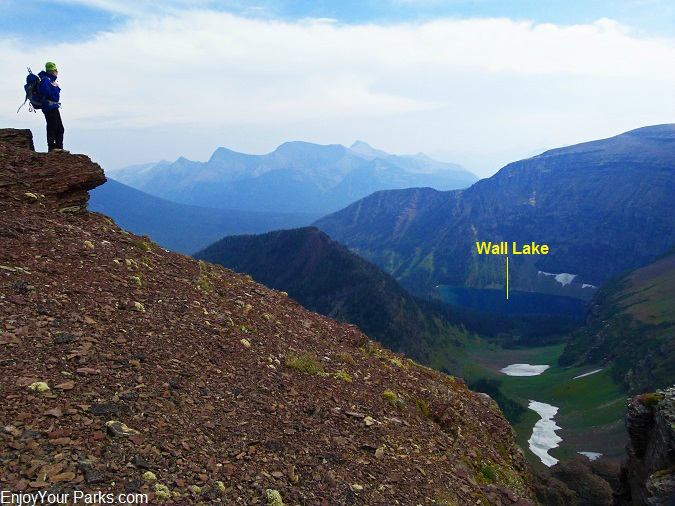 Wall Lake is appropriately named, as it rests directly below a gigantic wall. This massive wall is part of the north slope of Akamina Ridge, which you just hiked on top of earlier in the day. Wall Lake is very scenic, and is nestled in a wonderful old growth forest. 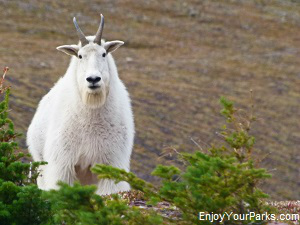 There is also a back country campground located near the lake known as "Wall Lake Campground". Wall Lake is the perfect place to enjoy a nice lunch as you gaze upon this scenic sub-alpine lake and the huge wall that surrounds it. 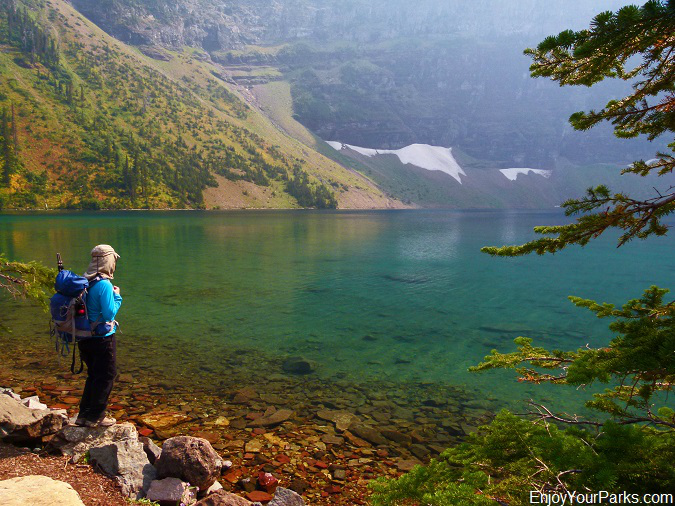 You will hike through a gorgeous forest as the trail takes you back to the Forum Lake-Wall Lake Junction at about mile 12.4 (see photo above). The trail is quite level here, and is a great section of the hike to wind down and reflect on your wonderful day on top of the world. This officially marks the end of the actual "loop" portion of your Akamina Ridge hike. The trail then once again takes you back into Waterton Lakes National Park, leaving the Akamina-Kishinena Provincial Park. Beyond the Waterton Lakes National Park boundary, you will reach the trailhead and your vehicle along the Akamina Parkway. This marks the end of your Akamina Ridge hiking adventure.